The Keith Duffy Foundation Annual Golf Classic 2017 is back again to fundraise for Cliona’s Foundation and Fighting Blindness. Pictured are Keith Duffy, Brian Ormond, Alan Clancy and Paul Brennan at the Heartbeat Trust’s Golf Classic at Powerscourt Golf Club. Photo: Patrick O’Leary/Goss.ie. The Keith Duffy Foundation Annual Golf Classic 2017 kicks off on Friday, September 8, 2017, at the internationally recognised Roganstown Hotel & Country Club in Swords, Dublin. Many new names have been added to the list of high-profile names who will be coming on to play golf and raise funds for this year’s chosen charities, including Ally McCoist, professional footballer, Rory Lawson, international rugby player and Kenny Dalglish, former footballer and manager. The Keith Duffy Foundation raised a staggering €28,000 in 2016 for Cliona’s Foundation and they are aiming for even bigger and better this year. A further €21,000 was also raised by the foundation for the Charities Fighting Blindness, the Hub and St. Francis Hospice By the Keith Duffy Foundation in 2016 through various events. 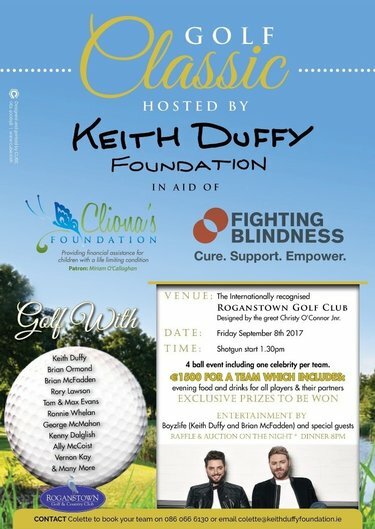 This year the Keith Duffy Foundation Annual Golf Classic 2017 will be fundraising in aid of two charities close to Keith’s heart – Cliona’s Foundation and Fighting Blindness. The Keith Duffy Foundation was established in 2015 to provide support and financial assistance to the Foundation’s chosen charities across the country. Keith has been using his experience and contacts, garnered through his 14 years as patron of Irish Autism Action to achieve the goals of the charity. On the day, there will be 4-ball event which includes one celebrity per team. The cost of a team is €1,500 and this includes an evening of food and drinks for all players and their partners, a 4-course meal, entertainment on the night by Keith Duffy and Brian McFadden of Boyzlife, surprise special guests and a raffle and auction with exclusive prizes to be won.